I haven't got the update and no other site is reporting on this so I would like to know where they are getting this from. here we go - official! link was garbled, had to change it to code. Add http to the above link. Forcing the update by clearing the cache of Google Services Framework or doing the *#*#checkin#*#* code did not do anything. Yup. Nothing here yet either. Nothing to do but wait until it hits. Yeah, I had the same issue. The link I pasted in was unusable. Guess what! First Update File is being installed! Ry and badcat like this. It finally showed up. I'm almost done with the first part of the upgrade. 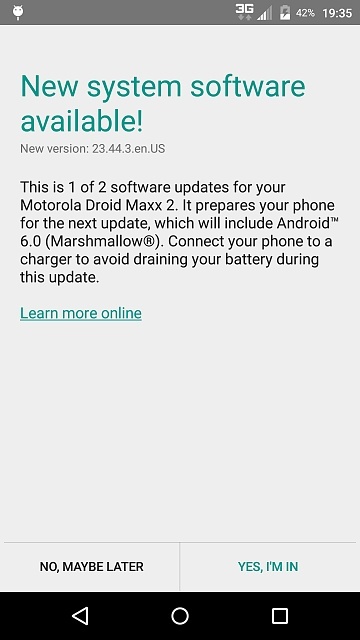 Edit: Both updates are installed and my phone is up and running. Running smooth so far. I may do a hard reset even though I'm not really seeing any problems. Going to run it as is before I do anything though. My second update is 50% done! Been waiting for this since I got my phone. Let us know how it goes for you. Mine has been running well. For the most part 6.0 is treating me well. However, for some reason the Kindle and Amazon music apps are refusing to take an update from the play store. Anyone else having this problem? Did you disable any of the other Amazon apps? If yes, try re-enabling them and see if the update now works. I did have audible disabled. But enabling that didn't make any difference. Sorry, I meant to say enable and restart the phone, and then first update the Audible app manually if you had it disabled. Then see if you can update the apps you want. You also may have temporarily enable installation from unknown sources in settings / security settings. See http://forums.androidcentral.com/mot...zon-prime.html for a similar problem when the T2 received Marshmallow. I couldn't agree more. As well as the insidious DT IGnite crap. DT Ignite is the first thing I disable with the Amazon apps being next. I don't hate on Amazon at all but like you say, I'd install the app if I wanted it. I like my Maxx 2 but Verizon's bloatware is completely out of control. I'll be buying an unlocked phone next time around. I'm stuck with them as there just isn't a better option coverage-wise where I live. What does DT Ignite even do? I agree in principle against bloatware, but honestly this phone isn't that bad compared to some verizon phones. In fact the Amazon helping is greatly pared down to 4 apps from about 9 on my old Turbo. In all, i've got about 5 verizon apps disabled. I regularly use kindle, underground, and music, so i did have audible disabled, but the update thing made me undo that. One annoyance: for some reason this phone lets me put far fewer apps on my SD card than my Pure Edition does. That might not be a phone thing, it may be a 6.01 vs. 6.0 thing. Anyone know? It allows the carriers to remotely install even more bloatware. When I first about this I though "they have to be kidding" but it's real. I'm pretty sure that the way this phone uses dt ignite is to make sure that the current roster of bloatware is installed after setting up the phone from scratch, or after a factory reset. I don't think the Verizon is pushing even more bloatware after the fact. I've read something to that effect regarding the flap over it getting installed on the S7. It doesn't matter to me either way, I'm disabling it. I'm not going to take the chance. All this junk takes up space and can potentially waste battery. I think that if Verizon would let us uninstall it almost everybody would. But like I said, it's really up to each individual user as to how much this stuff bothers them. Take a look here http://forums.androidcentral.com/mot...turbo-2-a.html (see post #4) to see how much stuff can actually be disabled. This list is exhaustive and includes a bunch of stuff that most users would not disable but it is interesting to see how much junk you could "theoretically" get rid of. Does the HTC 10 home button click down?